A pensioner got on his bike to celebrate a major milestone among family and friends. 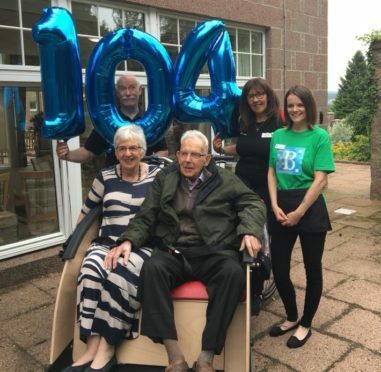 James Munro, who is originally from Aberdeen, turned 104 last week surrounded by his loved ones at Alastrean House care home in Aboyne. A former maths and science teacher at schools across the city Mr Munro has lived at the home since December. To mark the big day, staff at the care home organised live music and also a visit from Cycling Without Age, a charity which helps older people enjoy the bike riding experience. The charity has a rickshaw-style vehicle with a wheelchair attached to the front and a bicycle at the back allowing people to be transported around. Mr Munro and other residents at the home were given a trip around the home’s sprawling grounds. His daughter Isobel Kinnon said it had been a fantastic day and thanked the care home for its efforts. She said: “Rebecca Brice, the events coordinator, worked very hard to organise a special and memorable day for dad. “The staff were so willing to get involved and two of the staff even came in on their day off to join in and help dad and the residents enjoy the entertainment. Cycling Without Age was launched in Scandinavia in 2012 and the first Scottish chapter was started in Falkirk in 2016. Now the care home is considering starting its own group as it proved so popular at Mr Munro’s birthday. Christine Bell, executive officer, said: “James had a fabulous time and it was great for us to be involved.